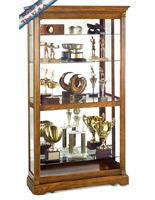 These oak display cabinets are 48"w x 77" high with lighting and ideal for the presentation of awards, trophies, or as a lobby fixture. Cove molding beautifully accents the exterior of the case. 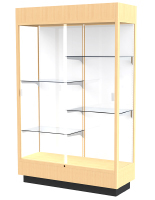 These oak display cabinets feature a medium carmel oak base with an attention-grabbing mirror back, sliding doors with tempered glass and built-in lock for extra security. 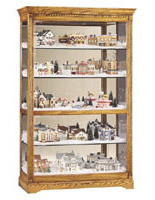 There are three 14" deep full-length adjustable shelves with brackets and a built-in lighted cornice which highlights your collectibles. 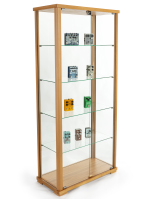 These oak display cabinets feature lighting at the top of the case and requires two basic tube-strip flourescent lights (bulbs not provided). The unit plugs into standard 110 electrical outlet. 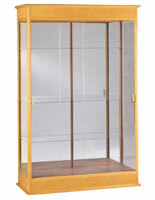 All of the wiring for these oak display cabinets is run through the back and exits out of the top of the case. 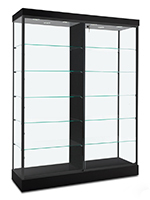 Special glass is built in directly below the light bulbs to diffuse brightness and protect the visual beauty of the case. 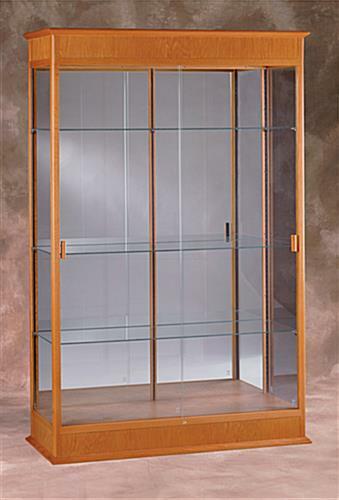 The oak display cabinets for sale here weighs approximately 240 pounds and ships by truck.